Sustainable Wales (with support from BCBC Reach - Rural Development) is looking to commission a feasibility study to demonstrate the feasibility of local community transport using locally produced renewable energy. "Our share offer is now live – invest now! You can invest from just £100 and earn an average annual return of 5% over 20 years. Surplus returns will go to a local community fund and to support Community Energy Wales in developing similar projects." Sustainable Wales is hoping to establish a local community energy group that will build on the renewable energy work now being undertaken within the county borough. The first meeting will be held on January 25th 2018, 7pm, The Green Room, above SUSSED, 4/5 James Street, Porthcawl CF36 3BG. The need for a low carbon future is agreed internationally. Community energy will democratise electricity supply, as highlighted by Sustainable Wales’ earlier Shine a Light campaign. “Many community groups across the UK are considering how to capitalise on this and create local jobs. However, this isn’t yet happening in Bridgend”, said a Sustainable Wales, spokesperson. 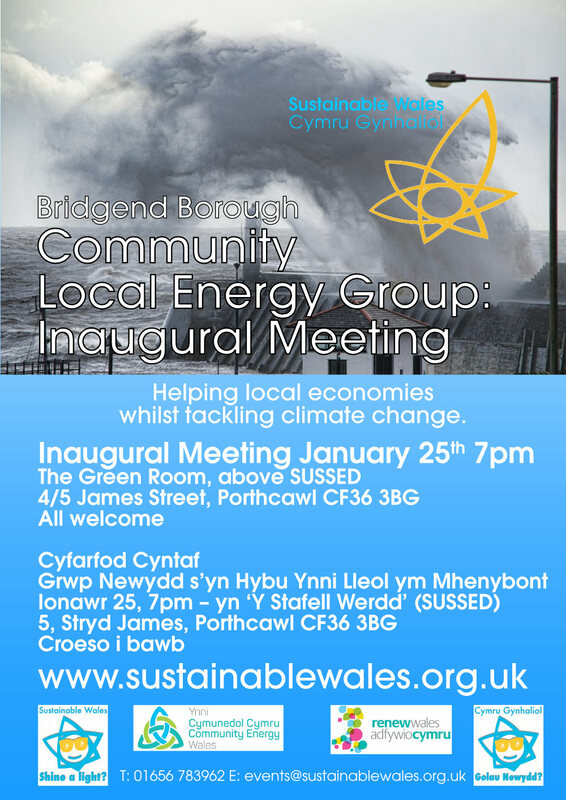 New Community Local Energy Group Bridgend Borough Inaugural Meeting January 25th 7pm The Green Room, above SUSSED 4/5 James Street, Porthcawl CF36 3BG. All welcome. In September 2017, the Welsh Cabinet Secretary for Energy, Planning and Rural Affairs Lesley Griffiths announced she wanted Wales to generate 70 per cent of its electricity consumption from renewable energy by 2030. The Cabinet Secretary also set targets for renewable energy projects to have at least an element of local ownership by 2020 and for at least one Gigawatt of renewable electricity capacity to be locally owned by 2030. “The group will become involved in Community Energy Wales and the Renew Wales networks, but will need all types of motivated talent as there is much to do and many ways of working, added the spokesperson. “We look forward to a fruitful evening.” more info contact mm@sustainablewales.org.uk. COMMUNITY ENERGY? ALIVE AND KICKING! Sustainable Wales visits the 2017 RENEW Wales Annual Conference to learn how the community groups are influencing the low carbon agenda in Wales. Producer: Sustainable Wales Productions Film and Editing Eamon Bourke, Park6Productions and Margaret Minhinnick, Director Sustainable Wales. Reach followed this up with a workshop on community renewable energy. Following the workshop reach commissioned a study to identify opportunities for community renewable energy in rural Bridgend and are in the process of commissioning for a delivery body to deliver a rural household energy awareness and community energy campaign and to project manage one community’s journey through developing and implementing a community energy project of their own. You can find the tender here. We have since discovered that quietly there has been a lot of activity regarding local energy in Bridgend and Sustainable Wales have agreed to draw attention to these projects and to host a workshop Bridgend’s Local Energy Revolution. It is an exciting time for local energy in Bridgend County and the event will provide an opportunity to hear about some of the projects currently underway and also an opportunity to discuss what’s next for developing local and community energy in Bridgend County. Please download here the event invitation and further details. You can also view the invitation document and agenda below (click to enlarge the images). Bridgend: FREEDOM energy project - save up to £10,000 on a new efficient boiler! 24 households are being invited to take part in this FREE pilot Energy Saving Scheme located in Bridgend Borough this summer. 50+ homeowners are already taking part with PassivSystems www.passivsystems.com limited places still available... Details below. Margaret and Robert Minhinnick of Sustainable Wales have agreed to participate saving between £7-£10,000 on a new combi-boiler and air-source heat pump. PassivSystems are managing the world leading project based in Bridgend. It's trialling hybrid heating systems which is a combination of a gas boiler and air-source heat pump. We are searching for a total of 75 homes in the Bridgend area. Potential savings on your heating bills. Gift card rewards for taking part in project surveys and interviews. The chance to reduce your carbon emissions and directly improve the Bridgend’s carbon footprint. Installations will be taking place in July 2017, August 2017, September 2017 and October 2017. An installation typically takes 3 to 4 days, homeowners would be without heating and hot water for no longer than 4 hours (in the middle of the day) over that period. PassivSystems will be monitoring the hybrid heat pump until April 2018, the project ends in May 2018. The homeowner will not incur any costs or have to pay for anything. Once the project is complete, the homeowner will have to complete the annual service which is typical of all heating systems. One Wales Energy - Un Ynni Cymru launches! “We’ve known each other for over 20 years and have both worked in the commercial, public and not-for-profit sectors. During that time we have started and run our own businesses providing services to the general public and business communities in Wales. Most recently we’ve worked together in the renewable energy sector and as partners in our energy consultancy, offering advice to clients in South Wales. We started to look at ways in which an energy business could offer a fairer and more exciting energy future for Wales, where energy is more affordable and sustainable and people in Wales could benefit from the profits. One Wales Energy – Un Ynni Cymru was born! We are totally committed to bringing a new approach to energy supply in Wales. We’ll be offering competitive tariffs, generating profits for investors in Wales, supporting community projects and helping to nurture a cleaner, greener, more resilient domestic energy supply sector. Everything we do, from our Wales-based bilingual contact centre to fair tariff pricing, to our business structure and local ownership – is all part of working to achieving this goal. The Welsh domestic energy supply market is worth £1.4 billion. We aim to secure 10% of that market by 2023 and you could benefit from the profits! We will run One Wales Energy – Un Ynni Cymru as a ‘profit with purpose’ business. This approach combines a conventional profit-making business with a commitment to supporting social and environmental benefits for Wales. One of the ways we will do this is through a Community Affiliate Scheme, offering organisations a way to generate a long term income stream, by earning referral and retention fees when their members, supporters, local community etc. switch to us. As part of its 'Re-energising Wales' project, the IWA held a roundtable discussion on Tuesday 6th June in order to explore and build consensus on how to take forward recommendations from the IWA ‘Funding Renewable Energy Projects in Wales’ report, launched earlier this year in April. The roundtable benefited from a diverse group of experts from within and outside Wales, including financial institutions, Welsh Government, Welsh local government pension funds, developers, community groups and others. The event note, which provides a summary of discussions and agreed actions, can be viewed here on the IWA website. I’ve been working in the renewable energy sector since 2004. Of the thousands of people I’ve met during that time, I’ve never encountered anyone who opposed community energy. Even the anti-wind die-hards don’t object to community energy — as long as it’s not wind, natch. You’d think that with widespread public, civic and political support for community energy it would be ubiquitous. But it’s not. Not even close. Less than 10 MW of Wales’ 2,300 MW of renewable electricity is community-owned. That’s a miniscule 0.4%. There have been a number of concerns raised recently about the future of community energy - withsome local groups understandably worried about cuts to Feed-in Tariff rates. However Graham Ayling, Head of Energy Saving Trust Foundation, thinks its time is coming. 'There's no denying that the past year has been incredibly tough for community energy groups who've put their heart and soul into projects, only to have to go back to square one as government policy changed. However, this is an incredibly resilient sector, full of people determined to drive forward action on climate change and bring about a fairer, more democratic energy sector. It isn't about to roll-over and give up. Full article at WCVA site. "It's incredible growth and a pattern that's being repeated globally. This is the future. Look at solar PV - a few years ago there was no financial payback, now it's on the verge of becoming one of the cheapest ways to generate energy. Uptake has been way beyond what anyone expected, because it's a popular technology. This isn't going to go away. The aims of ‘Shine a Light?/Golau Newydd?’ are to profile local community energy, to educate, and to provide an effective campaigning tool. A vital step should be to develop new partnerships. Importantly, these must include Local Authorities. ‘Shine a Light?/Golau Newydd’ directly challenges local politicians ‘to wake-up and smell the coffee’ as one contributor, Alan Simpson, says. But there must be mutual benefit, and the community energy network must be better at communicating our approach. We cannot expect the excellent Robert Proctor to do it all! Community Energy faces many obstacles but ‘Shine a Light?’ outlines the potential in local jobs, community involvement and regeneration, whilst reducing our local carbon footprint. What we learned in the making of the film is that those who work on community/local renewable energy projects are real local heroes. As director I attempted to become familiar with the often intricate detail of renewable projects. Often, many years of activists’ lives are dedicated to community renewable energy. The people we interviewed for the film – from Bro Gwaun to Awel Aman Tawe to Taf Bargoed to Cenin at Parc Stormy, clearly had to learn on the job. Often the hard way. Yet it is unlikely that politicians can or will get to grips with community energy, unless there is a groundswell of support from the public for local renewables. However, who does stand out is former Labour MP, Alan Simpson. It is Simpson’s enthusiasm for local energy that originally inspired Sustainable Wales to make ‘Shine a Light?’?Golau Newydd. Everyone at our charity feels that there is enough international evidence, and certainly a moral case, to ensure far better provision of local energy. But we understand that these heroes have to spend so much time getting projects off the ground that little opportunity remains to explain either their difficulties or their projects’ virtues. Excellent advocates and communicators such as Alan Simpson are vital. But it’s also important that ‘practitioners’ become lobbyists, as Paul Kent, Dan McCallum, Tom Latter and Martyn Popham have proved. Others in the network need to help. It isn’t enough for the environmental NGO’s to campaign, local energy practitioners have to become more vocal as we develop a local economy fit for the twenty-first century. Shine a Light? / Golau Newydd? was the only Welsh made film in the 2016 UK Green Film Festival held in Chapter Arts Centre, Cardiff. (Screened May 6). The discussion afterwards was thoughtful and stimulating. Sue Essex (former Welsh Assembly Environment Minister) commented on the importance of providing evidence such as ‘Shine a Light?/Golau Newydd’ for politicians. Crucially, everyone agreed, the film must be screened as widely as possible, using all social media. “The community energy movement needs to innovate; to find new ways to bridge the gap between where we find ourselves today and the arrival of grid parity”, comments Leo Murray Director of Strategy 10:10 in “Community Energy The Way Forward”. Your suggestions are very welcome. Letters of support and creative ideas would also assist in grant applications, crowd funding, etc. Sustainable Wales believes that well made film can communicate in a uniquely powerful manner. But to achieve high quality production, we require funds. Shine a Light?, a 20 minute politically challenging film, supports the idea of democratising our energy supply, bringing ownership and profit back into communities whilst reducing climate change. Local energy schemes are massively important in Germany and other EU countries, whilst the UK lags far behind. Filmed by Park6 Productions for the charity Sustainable Wales, it features former MP Alan Simpson, Professor Calvin Jones and local groups and a superb soundtrack from Twm Morys. Join us for a post-screening discussion with the Director, Editor and representatives of Community Energy Wales. Free but ticketed, drinks reception afterwards. If Wales is to meet its climate change obligation of at least an 80% reduction by 2050 we need to change the way we think about energy; its generation, distribution, storage and conservation. The landmark deal on climate change in Paris last December sets a framework for Wales to accelerate its action in this area, making real strides towards reducing its greenhouse gas emissions and setting the bar high for a new energy model. Leadership is key to achieving an energy transformation, with a clear and stable policy direction paving the way. This policy must lead Wales to a decarbonised energy system, with the aim of Wales meeting all of its energy needs from renewable sources. Local energy supply to local markets is a cornerstone of this new policy, and, whilst larger-scale inward investment projects will continue to play a part in providing energy security, diffused local solutions must also feature highly in a future renewable, sustainable energy jigsaw. Energy conservation and demand reduction must be addressed, and are areas where Wales holds the necessary levers and powers to take action now. Both new buildings and existing housing stock present opportunities to improve energy efficiency. Up to date history of the debate surrounding this issue from the Environment and Sustainability Committee at the National Assembly for Wales. A new film in the Shine a Light series about the "local heroes" of Community Energy is in production. Subscribe to our YouTube Channel so you don't miss the new release.